After purchasing my first complete set of metal dice from DnDice it quickly became apparent that if I wanted to make good use of them it would be wise to invest in a dice tray to roll them in. There are plenty available on the market, covering all manner of styles. 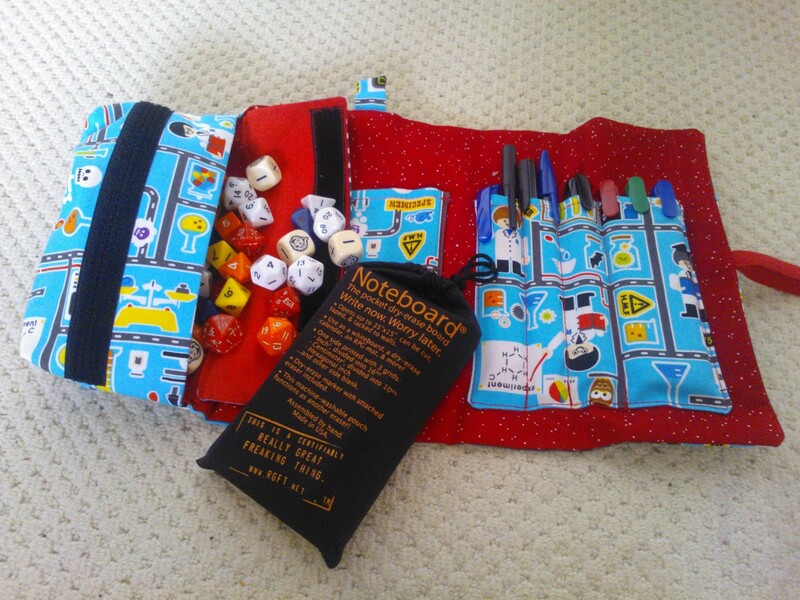 I am already a convert to the All Rolled Up gaming organiser so to accompany it I picked up one of their neoprene folding dice trays. The only downside to the tray is the depth, being made of neoprene it sacrifices the weight of a heavier felt-lined tray for flexibility and portability. I was aware of this when I purchased the tray but if I were to ever acquire a heavier set of metal dice than I currently own it would probably require an upgrade to a sturdier tray. All in all, I can definitely recommend the folding dice tray, it’s a good product at a comfortable price point (£12 at the time of writing) and an accessory that would be a valuable addition to any gaming table. All reviews are rated out of 10, with Natural 20s reserved for products that go above and beyond my expectations. Unless otherwise stated all review products have been purchased through normal retail channels. 27th) What are your essential tools for good gaming? Character sheets, dice, 1 copy of the core rulebook. That’s really all I’d term as essential but if we’re expanding out then I’m going to cheat and point you towards a previous post where I detailed my gaming kit. At the centre of it is my All Rolled Up which is one of the best gaming purchases I’ve ever made. 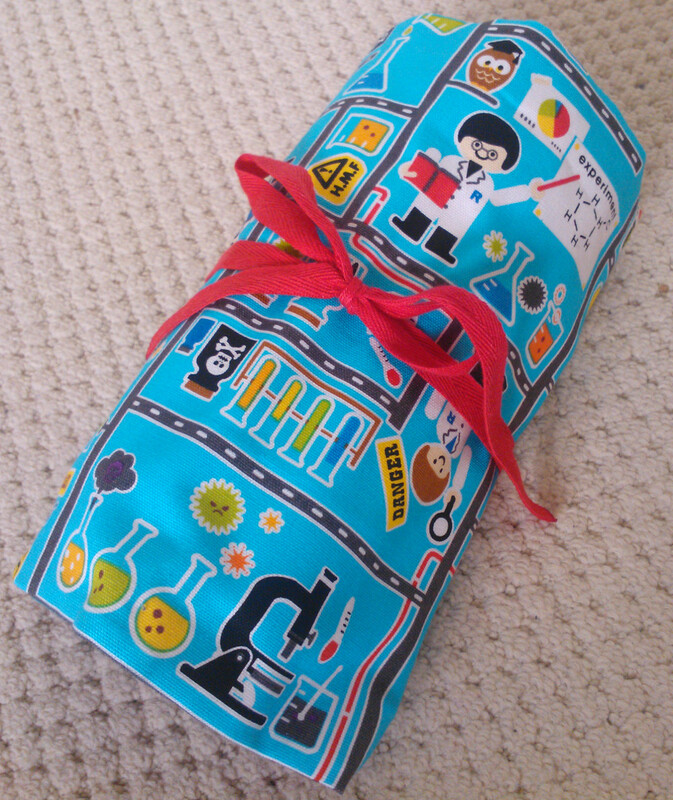 Plenty of space within it and ideal for storing the foldable whiteboard and a selection of dice. This post was originally posted over at Nearly Enough Dice. As you’ve probably realised the various contributors to Nearly Enough Dice love gaming accessories and a number of the products we’ve reviewed for the podcast now form the core of what constitutes my gaming kit. With that in mind I thought I’d share my approach and invite the readers to chip in their suggestions or ideas. At the core of any gaming kit is (IMHO) one thing, dice and like most gamers I have collected a considerable number over the years. When I’m playing, however, most of those dice are unused. In an attempt to streamline my kit I’ve, therefore, cut down the number I carry to 4 polyhedral sets which covers me most games and can be rapidly altered should I join a game that requires more of a particular type. But what to carry them in? How about an All Rolled Up (ARU), which Liz reviewed recently for the podcast? Having just purchased the one pictured I can also now attest to both the quality of the product and the service (I ordered Monday afternoon and received it on the Thursday). As well as dice my ARU stores a number of other important parts of my gaming kit. First up are pens, a basic component that people forget on a regular basis. Second is my noteboard, another recent purchase and which Liz reviewed for the podcast (and Mike put to good use for the War of the Dragons game). Although the noteboard really falls into the GM kit category it’s simply far too useful an item for me to leave out so it’s got a semi-permanent place in my ARU. Finally to round out my players kit is a selection of extra whiteboard markers in multiple colours, there just in case the noteboard gets used. The basis for my GMing kit is, unsurprisingly, that of my player kit but with some notable differences. First is more dice, because it’s apparently up to the GM to have spare in case players forget their own. If required I then add in my GM screen. 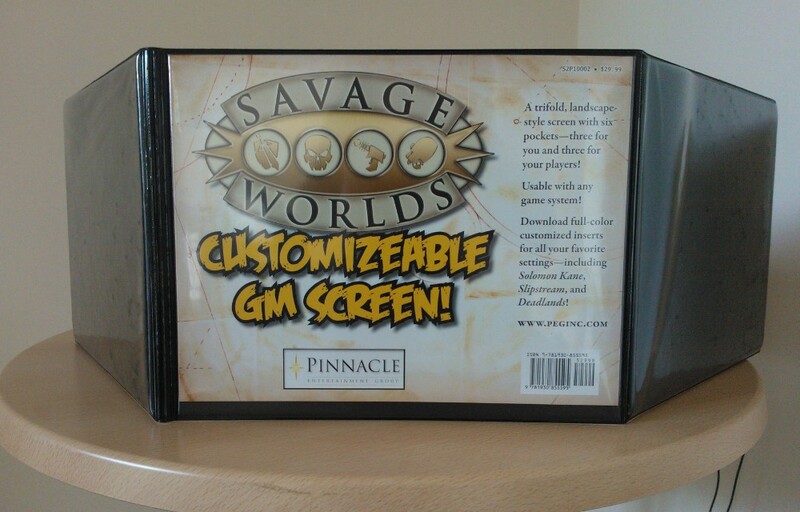 I’ve tried multiple system specific screens but these days I default to the Savage Worlds Customisable Screen (see my review for more information). The ability to add to or alter the panels as required makes this screen indispensable, I find it particularly useful for tracking characters disadvantages so I have a ready list of hooks I can tap during the session. 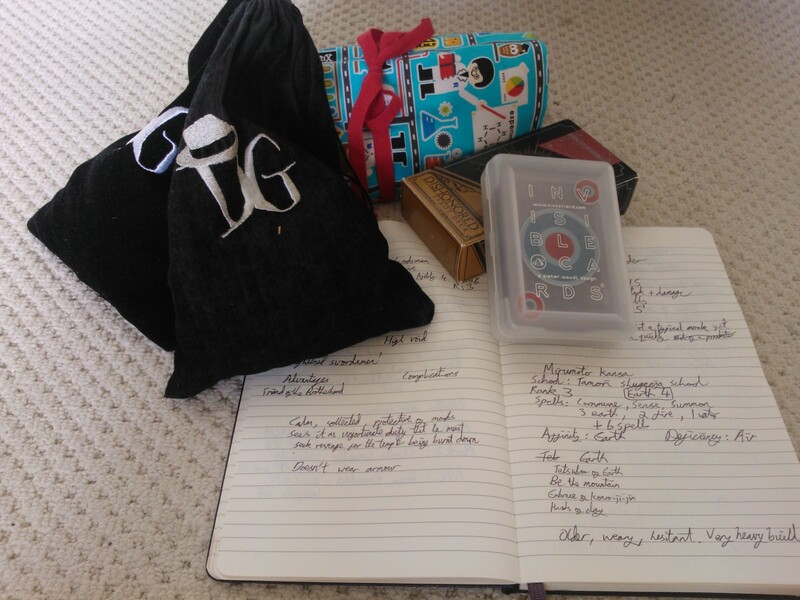 Most of the other additions are system specific, poker chip tokens or a deck of cards are added as needed, stored in my ARU or dice bag in order to keep it all together.The final essential component of my GM kit is my moleskin notebook. Between games it lives in whatever bag I’m using that day so I can jot ideas down at a moments notice, which often turns out to be on the train during my commute to work. While I’ve tried digital approaches such as Evernote my approach to note taking is too haphazard for a digital approach, mostly due to my frequent use of multi-directional connections and non-sequitur notes. Obviously the vast majority of this kit is only of use when playing together as a group in a single location. Online gaming is, however, a growing market and probably accounts for half of the games I’ve played in the last year. Three websites really provide me with all I need on that front, Google Plus, Roll 20 and Obsidian Portal. Google Plus, combined with Roll 20 provides both the table around which players assemble and the tools such as dice roller, initiative tracker and battle map for playing on. The quality of the Google Plus video hangouts astounds me each and every time, sure lag is an occasional problem but thanks to it I’ve been able to join regular games with players spread throughout the globe. Between games Obsidian Portal serves as a centralised location to store notes and game progress in a convenient wiki format which is currently undergoing a redesign. While an extremely powerful tool I’ve found that the majority of use is by the GM and it predominantly falls into a planning tool and place to keep notes that can be revealed to players as they experience the world. So there you have it, the basic kit that I make use of on a regular basis and a question for the listeners / readers, how do you do things? Am I over prepared or maybe missing out that one item you consider indispensable to gaming? Disclaimer: This is not a product placement post, I purchased each of the items described here and none were received for the purpose of a review. I merely happen to think that they’re all awesome.